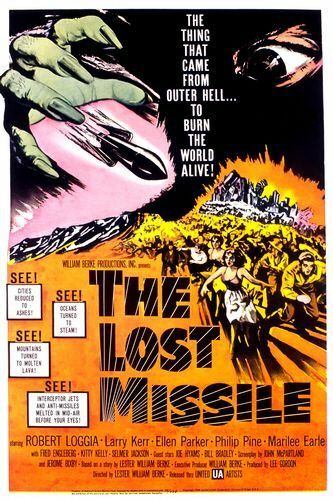 The Lost Missile (1958) -- Full Movie Review! Today we have a forgotten little gem from the early days of American science fiction, a fun little time-waster that never failed to keep me interested (and I'm easily distracted!). The acting, sets, props, and costumes are above average for the piddly amount of time we see them. And that's the main problem with The Lost Missile, that the material specifically shot for the movie makes up maybe only 30% of the total 70-minute run-time, the rest of it is stock footage. While the use of such easily available library footage is not uncommon in early sci-fi movies, its outrageously egregious overuse here is really something to behold. They even thank the US military "for their assistance" in the opening credits! We open at the "Havenbrook Atomic Laboratory" on Long Island, NYC, a US government research reactor and nuclear missile assembly plant (of course, Havenbrook is just a wink/nod to the real-life Brookhaven lab). Here we meet our male lead, David, a scientist working on the nuclear warhead for the "Jove rocket", the fastest and most powerful solid-fuel intercontinental rocket in America's arsenal of democracy. 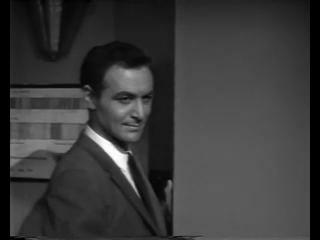 David (hey, that's Robert Loggia!). 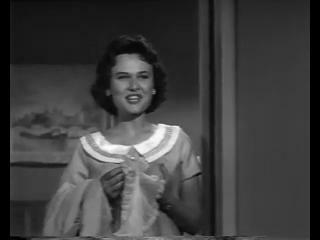 The female lead is Joan, who is David's lab assistant and fiance (workplace fraternization, indeed). Joan is typical of 1950s women scientists, only given menial tasks to do in the lab, always subordinate to male scientists regardless of their disciplines, and forced to wear tight skirts and five-inch heels even on the lab floor. She's also not allowed to steal the male lead's thunder and has to cry like a little girl whenever something even slightly emotional happens. Her hair is pretty cute, though. 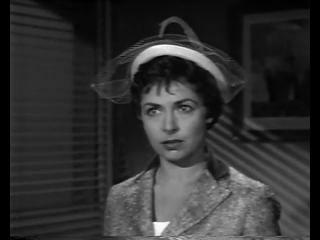 Joan (wow, bad hat, bad hat!). It's supposed to be their wedding day today, but David is so obsessed with his work that he's just not paying attention to her. 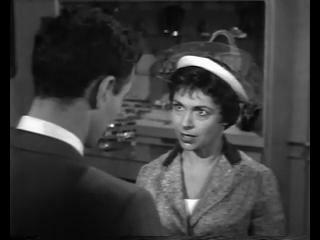 Joan gets pissed and they argue about priorities. David tells her that she's a fool to be so emotional because she's "also a scientist!". Ah, so, apparently being a female scientist means you have to be an over-analytical stone-cold block of dispassionate ice? Really? Hard to take her seriously with that hat. We leave our (un) happy couple now to go into the atmosphere over Russia, where a huge "missile" has been detected. The Rooskies don't know where it came from, and at first they want to shoot it down, but it's going too fast to catch. By now it's heading southeast, over Alaska, on a line through Ottawa and New York City and then out to sea. It's traveling at over 4,000mph and is for some reason pumping out a "heat field" in a five-mile radius that can melt anything it touches. Obviously, if this missile passes over populated areas (as it will), there will be catastrophic casualties and damage (sounds like the Alpha rocket in Assignment: Outer Space). We never really get a good look at it, however, just a side-view showing some pointy things on the nose. The missile (why is it "lost"?). 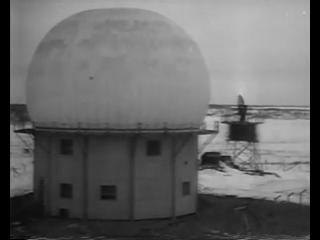 At a DEW line radar station in Alaska they see it coming and scramble an Air Force fighter jet to check it out. 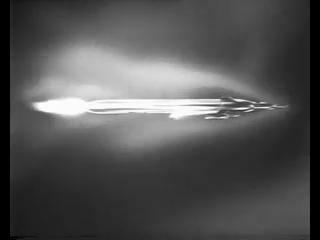 After confirming its course and speed, the jet takes some video and then tries to attack, but is "melted" when it gets too close. 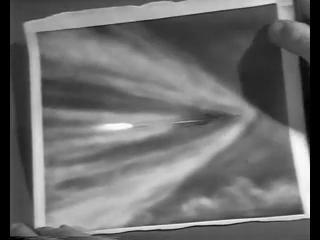 The scene with the jet is our first indication of this movie's sick puppy love for stock footage, and, as well, its unconcern about matching details of said footage to anything that's happening in the rest of the movie. Jet pilot (probably from 1949...). The ADHQ calls in the Canucks to send their Air Force against the missile. 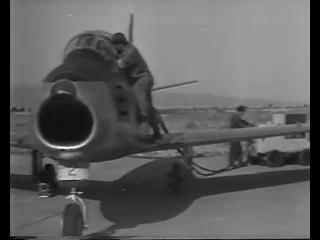 We get a collage of stock footage F-86s, Hunters, and CF-100s as the RCAF scrambles its forces in a scene that lasts about twice as long as it should (first of many...). 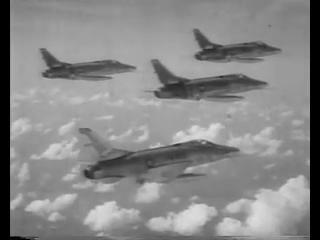 The Canadian fighters meet the intruder and open fire, but the "bandit missile" just blows right past them, "burning them out of the sky" in the process. 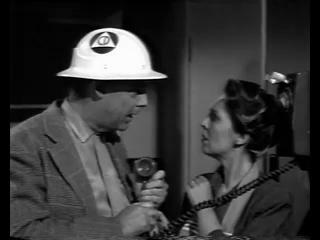 Down at the Havenbrook labs there are alarms and frantic scientists with flapping ties. The atomic pile is drowned as a precaution and a staff meeting is hastily called with all the Havenbrook supersmarty scientists sitting in. They are informed of the missile and its unknown origins and intents, and of the fact that its cruising along at 4,078mph at 24,200 feet high and is churning out a heat field at over a million degrees due to it's "hydrogen drive". 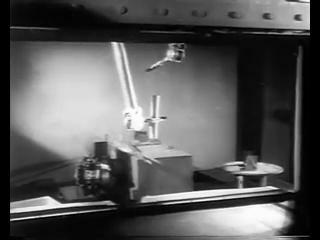 One guy explains, "A high-order magnetic field can be projected from this missile without any damage to itself." Okay. The staff will be evacuated, as "they can't afford to lose you", and they better hurry as they only have a shade over an hour before New York is fried. 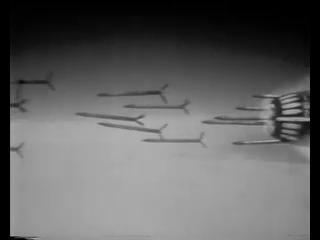 We take some time off now to have a recruitment film for the Strategic Air Command. Ten minutes worth of stock footage B-52s, B-47s, and B-36s roar down runways and leap into the air to a stand-up-and-salute marching tune. Why are we seeing this? We already heard that everyone knows the Rooskies didn't launch the missile, where are they going? Frankly, I can never see enough radar domes. The East Coast is on high alert and New York is freaking out. The movie now becomes a Civil Defense information film as the ever-present narrator reminds us to always listen to our Civil Defense Wardens in a time of crisis. They show/tell us about normal citizens, factory workers and accountants and disc jockeys, who put on their Civil Defense helmets and grab their flashlights and take up their assigned positions to help their fellow citizens survive. Good luck trying that in 2010. Phones for official CD business only! Back at Havenbrook, the staff is being evacuated when David suddenly has a wild idea and runs to stop the General before he leaves. 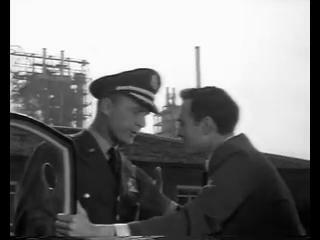 David tells him that they can use Jove to intercept the rogue intruder, as Jove is the "only missile that can get through that heat fast enough", whatever that means. David doesn't have time to construct a full-size atomic warhead, but if the General gives him 20 minutes he can "assemble a baby warhead" using only the atomic trigger fuse, and in 20 more minutes he can get it to the Jove launch site and install it in the rocket. Wow, who knew nuclear engineering was so easy and quick! Meanwhile, the US Air Force scrambles everything that can fly to try and knock down the "missile from hell". Back to being a USAF recruitment film now as we see a long (long!) stock footage reel of jet fighters taking off and flying north. As a dedicated obsessed plane-nut, I loved seeing all the Starfires, Sabers, Thunderstreaks, Delta Daggers, Scorpions, and Thunderchiefs, but I can imagine how the average viewer would get bored pretty quickly at all this library footage. The air battle itself is over pretty quick. The USAF intercepts the missile over central Canada and lets fly with rockets and cannon fire. Copious amounts of stock footage here, of all sorts of ordinance blasting, Falcons and FFARs and Genies and cannons galore. Nothing has any effect, of course, and the missile races on. I won't bore you with a discussion on the total impossibility of a successful interception, with the closing speed and altitude of the missile, plus the pitiful rate-of-climb of these jets, the window for them to obtain a shot on the missile would be infinitesimally itty bitty. But kudos for the effort, boys! 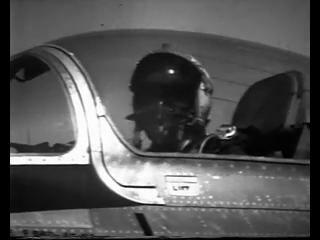 fired from a F-89's wingtip pod. Ottawa is now in trouble. As the missile approaches, we get some scenes of normal Canadians doing normal Canadian things (making snowmen, smoking pipes, growing bad mustaches, that sort of thing). The city is on Red Alert, and the subways and shelters are crowded with stoic hearty Canucks, whose last dying wishes are surely that they could be reincarnated as Americans. the ugliest man in Canada, you pick. The last ditch point-defense rockets have no effect and Ottawa is toast (literally). Some nice mattes here as the city is melted by the million degree heat as the missile races overhead. And Ottawa won't be the last city so rudely treated, as, if the missile maintains its current speed and vector, it will eventually circle the globe enough that any number of populated areas will be roasted. Someone with more grasp of orbital mechanics tell me if it would just circle around the earth on the same course that it is on now, just burning over the same path over and over again. Or would the difference between the object's speed and the rotation of the Earth make each orbit pass over a different area of the planet? Now someone tell me why I care. New York's Governor goes on TV with a special broadcast where he declares martial law and "Situation Red". He tells everyone not to panic (sure, get right on that), everyone should get to a bomb shelter (yeah, right), and children need to be evacuated first (that's fine), and that "as long as you have faith you will be alive and well" (oh, ok, thanks). 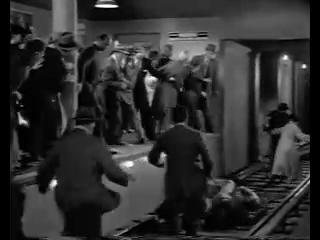 Of course, people panic immediately and there's a mass chaotic exodus out of the city from all points. Conelrad radio broadcasts Civil Defense alerts, but it seems like most people just want to run like hell (cowards!). Let them run, they now have less than an hour until the missile is here, so it's not like most of the 8 million people in the city have a chance anyway. 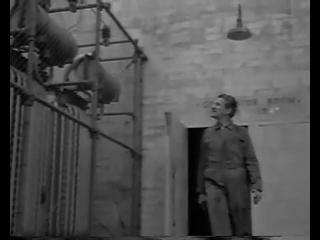 We go now to some vital generator plant, where loyal men with firm morals are staying at their posts despite the danger, because they know that the city is depending on them (them!) to provide the necessary electricity. They will stay at their jobs even as death falls upon them, because that's what true patriotic Americans do. And you should, too, if the Rooskies A-bomb us! if he doesn't have more than three teeth. 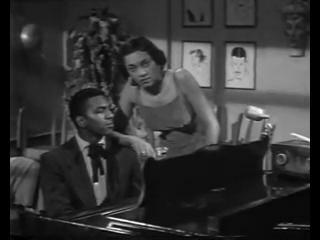 Suddenly we have an eleven second insert shot of a black couple listening to the radio. Whaaa...no way! 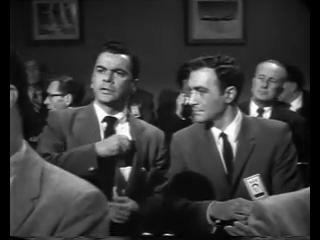 Minorities in an American sci-fi film from the 1950s, did I just see that? Wait, wait, wait, were they actually suggesting that black people lived in New York City in 1958? 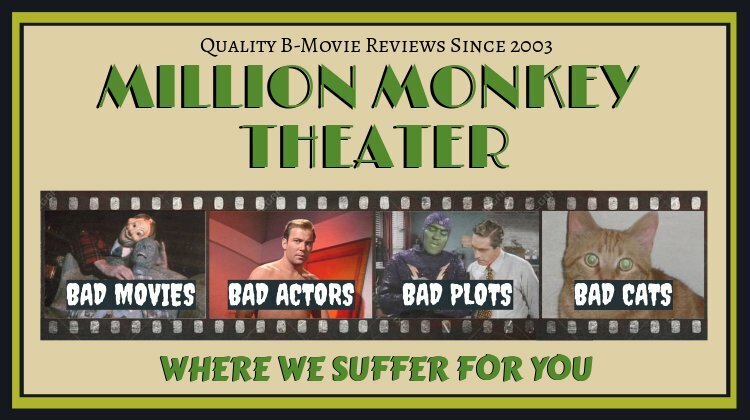 How dare they spread such scandalous lies to unsuspecting drive-in movie audiences across our fair America? Outrage! Probably cut that scene out for theaters in Alabama. In the hallway, David is stopped by a frantic coworker named Joe. 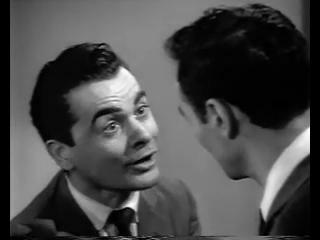 Joe has heard that David is planning on nuking the mystery missile and he's here to beg him to stop! It seems that Joe has figured out that the missile is not a lost intercontinental missile, but a lost interplanetary missile. It's from outer space! And it might have aliens in it! Joe tries to get David to see the possibilities of contact with an alien visitor and how frickin' awesome that would be. David, however, isn't a believer in such things and rudely shoves Joe out of the way. Doubter. Joe has other things to worry about, however, as his wife Ella shows up now. And she's seventeen months pregnant (though she looks like she's not at all)! And she brought along her mother, who has nothing good to say about her son-in-law. Ella pops out a baby boy in the next scene, but Joe can only lament the coming fiery end. David and Joan will take the nuke trigger from the lab to the rocket base in a Jeep, racing down the empty streets of Long Island. 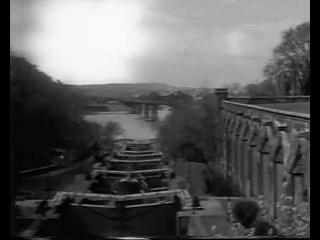 They talk as they drive along about the enormity of the situation, though they seem pretty blase about it all (Joan wishes they hadn't told the people about the lost missile, it would be better that they died quickly without panic). Now just a few miles from Jove Base, disaster strikes. A group of leather jacket-wearing duck-tailed juvenile delinquents ambush them and steal their jeep when their own hotrod breaks down. They beat up David, force a smootch on Joan, and run off with the Jeep. Punkass kids. David and Joan hitch a ride in an MG convertible (hey, that guy's in violation of the no-travel order!). They come across the Jeep not far down the road, surrounded by dead bodies. The criminal types unwisely opened the box in the back of the Jeep and died from plutonium radiation in a few minutes (does it really kill that quickly?). David knows that he needs to get that trigger to the rocket if the world is to be saved, so protecting his eyes with his sleeve, he runs and grabs the thing and tosses it back in the box. He's condemned himself to death, and he knows it. 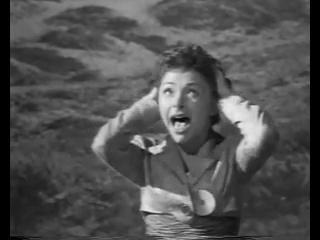 Joan also knows it and screams in anguish for David, who drives off, leaving her there in the road. Leaving Joan, for her own good. He has to hurry, Jove is on final countdown to launch and he needs to get the warhead there in time. Just four minutes now until they launch Jove, and David comes barreling through the front gate in his Jeep (what, no security?). He gets to the launch site with just three minutes to spare, scattering the ground crew like rabbits when he screeches to a halt in their midst (probably exposed them all to lethal levels). 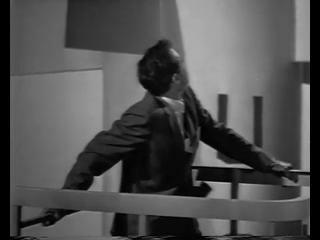 He jumps on a lift with the trigger and it rises slowly (oh so slowly) up to the nosecone. 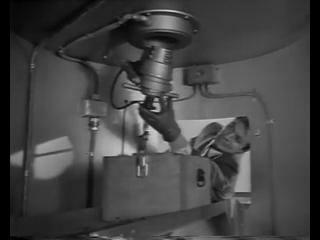 With just two minutes left, David reaches the nosecone and opens the door. He just sticks the box containing the trigger in a tray and something pulls the plutonium core out and up into an upper section. This looks absolutely nothing like the inside of an actual nuclear warhead, but you wouldn't expect it to. 1958 was still a time when filmmakers had to be careful about not giving away any "sensitive information" to the Rooskies, a very real concern that would get you a visit from the FBI if you strayed too close to that line. to the radiation poisoning on the lift, his duty done. 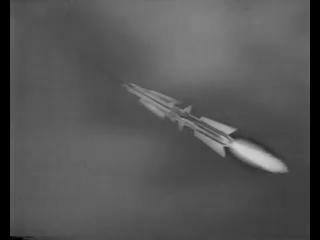 Jove shoots into the air in a miserable collage of dissimilar stock footage shots (Hey, it's a V-2! Ok, now it's a Redstone! No, it's a clip from Rocketship XM!). The Jove rocket looks more like a gaudy Flash Gordon space cruiser than an ICBM, with four sets of different sized fins and a coke-bottle flaring body. As it nears the interception point, the warhead bus rockets ahead, driving towards the rogue missile at incredible speed (5,000mph, they say). You know, it's not explained on-screen, but I assume that the rush to beat the clock was that Jove only had a tiny window of opportunity to hit the missile before it ran over New York, and if they delayed the launch even by a minute they wouldn't have been able to intercept the target. I wonder, though, if David hadn't gotten there fast enough, would they still have launched Jove anyway? It sure looked like they were going to. Anyway...kaboom! Insert stock footage of atomic test and stirring organ crescendo. Joan screams in pain over her dreamy David's ultimate sacrifice, but she knows it's over, the world is saved. Everyone comes out of the shelters and life goes on, the end, closing credits. Not exactly sure what the take-home message was supposed to be. On the surface, it's a pretty straightforward rah-rah "Go America!" theme, as the gallant military protects our borders and upright citizens stand shoulder to shoulder in the face of adversity. But on the other hand, it's hard to not notice that our vaunted military machine was completely and utterly helpless against the missile, and our government was at a loss to protect even one of us, suggesting more of a "war is insane" theme. Either one will work in the end, I suppose, but I was pleasantly surprised to see that The Lost Missile had such a nice blend of the two. So...what about that spaceship from outer space, eh? Is no one going to ask where the missile came from? Anyone?